Barrett celebrates scoring against Slovakia in a 2019 World Cup qualifier back in April. IT HAS BEEN a transformative past 18 months for Amber Barrett; one where she has become an Ireland international, scored in World Cup qualifiers, won back-to-back golden boots, been nominated for Women’s National League Player of the Year and balanced all of this with undertaking her teaching Master’s in DCU. Later this afternoon she will lead her team out onto the Aviva Stadium pitch for what will be Peamount’s first Women’s FAI Cup final in six years and their first ever appearance at the national stadium. Despite playing for Colin Bell’s Women’s National Team regularly, and achieving consistent success for both club and country, she admits that she has never played at the Aviva before. Today will be a special day, she says casting her eyes out onto the immaculate surface, but she is not one to allow the occasion to overtake her. Keeping composed and staying on top of the pressure of the day itself will be absoutely paramount, she says. Peamount are the bookies’ underdogs heading into today’s cup final, with opponents Wexford Youths having secured their fourth Women’s National League title in five years in 2018. “I’ve never played here before,” she smiles, taking in the view of the stadium a few days before. “I’ve been here for the men’s games and I’m actually looking to get tickets for the rugby Tests in the next few weeks as well. Barrett secured the Women’s National League golden boot last season with 16 goals. This year she reclaimed her prize, but this time around nearly doubled her talley — scoring 30 goals and netting an astonishing seven hat-tricks in 21 games. “It’s funny, at the start of the season I was talking to my team-mate Niamh Farrelly. I told her that I’m going to have at least 30 goals this year. She was like ‘no Amber, you’re mad!’ But just seeing the Ireland international players that had come in and the players that we already had, I knew how good our team could be. The 22-year-old holds the Continental Tyres Women's FAI Cup at the Aviva Stadium. “Even in training you’re watching certain phases of play and you’re just so intrigued by it all. I knew I could achieve the 30 goal mark I set myself if I wanted to, but at the same time — you score 30 goals and you’re nine points off winning the league, you wonder what the goals were for. The disappointment of losing the title on the final day of last season against Wexford and to come up short again this season against the Ferrycarrig Park side is etched all over Barrett’s face. It is true that 2018 has been a year of immense personal achievement for the Donegal forward, who is now an integral member of the international team having made her Ireland debut a little over a year ago against Northern Ireland in a World Cup qualifier in Belfast. But she maintains that personal accolades mean nothing if the team does not also succeed off the back of it. Today’s Continental Tyres Women’s Cup final is her first as a footballer, and she would relish the chance to secure a League Cup and FAI Cup double. “To be honest I don’t think we did ourselves any justice in the league this year,” she reflects. “Obviously going so close last year and losing it on the final day to Wexford was heartbreaking. After that we thought bringing in new players, bringing in that little bit of experience we needed would help, but I don’t think we clicked quick enough for my liking and I think that only started to happen in the second half of the season. Barrett is currently in the final year of her teaching Master’s out in St Patrick’s College DCU in Drumcondra. She teaches history and English in Beneavin College in Finglas, also recently taking classes in CSPE and PE. Teaching is incredibly rewarding, she says, with the day-to-day encounters she has with her pupils keeping her humble and grounded as she simultaneously pursues her education and her career as an Ireland international striker. “I’m in an all-boys school out in Finglas,” Barrett says. “It’s been absoutely fantastic. They are excellent, excellent lads, I can’t commend them enough. They are an interesting group and they know how to give me a bit of stick about different things… I don’t think the Donegal accent has settled just yet,” she laughs. But they are very good lads and I think that humbles me as well, going into class after doing something at the weekend. I went into school the day after we beat Shelbourne in the cup semi-final, and there was a lot of congratulations from all the students. “Ah yeah,” she grins. “Things like that are just funny. You can’t help but be grounded with stuff like that there. I’m not saying I need to be grounded, but just to have that bit of humbleness with them is very important. “I think lads get a hard time about not having recognition for girls’ sports that they should, but from my experience with the boys, they have had more than enough respect and recognition for me and what I’ve done. Even in PE, I think they recognise that I can actually move the ball a little bit. Some of the boys in the school are really terrific players. Really, really good. One of the boys is going to Dundalk, I think in November, and another one is playing for St Kevin’s. Barrett achieved one of her lifelong ambitions earlier this year, scoring at Tallaght Stadium for Ireland in a crucial World Cup qualifier against Slovakia. Her celebration was as emphatic as the finish — with the euphoric joy and happiness clear for all to see. It has been a whirlwind past year and a half for the Peamount United footballer. Just under two years ago she had to make the painful decision to step away from the Donegal inter-county panel, focussing her energy on trying to make the step up to become an international striker. She has succeeded beyond measure, with this season’s 30-goal haul in the Women’s National League with 21 games played a statistical indictment of the 22-year-old’s talent and ability. She has come a long away, she admits. To be honest, it’s all been a bit mad really. I suppose you don’t really get a lot of time to sit and think and reflect. You speak to successful players and they tell you that they don’t think about their career until it’s over. “Recently I have reflected just a little bit on what’s gone on over the last few months. As good as it’s been for me personally, getting my first Ireland cap and scoring my first international goal, it was still disappointing not to qualify for the World Cup. Being honest, I think that my performances did dip a little bit with the international team towards the end of the campaign. “That’s something that I have to manage — I know I have to work maybe a little bit harder in terms of lasting in games. “I can’t look back on the last 18 months and not be proud of myself as well, because I think that if you said to me two or three years ago that you’re going to be playing for Ireland, you’re going to be playing in an FAI Cup final at the Aviva, you’ll have scored against Slovakia in a World Cup qualifier — I’d have told you where to go. 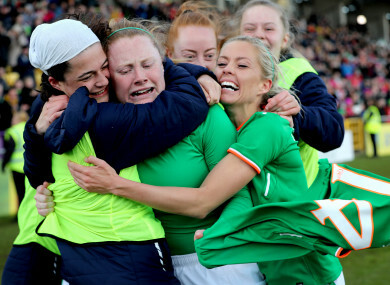 A role model to so many young girls who dream of following in her footsteps, the Ireland and Peamount striker has achieved so much at the age of just 22. In a few short hours she will lead her side out onto the famous surface of Lansdowne Road. The view will be quite different down on the playing field from the one she is used to as a spectator. There can be little doubt that there will be more than a few of her students from Beneavin College cheering Ms Barrett on from the stands too. Win or lose today, they will congratulate their teacher on yet another incredible accolade when she comes into class on Monday morning for another day of school. Email “'In PE class a fella turns around and says: lads she’s playing in the Aviva next week, so go easy on the tackles'”. Feedback on “'In PE class a fella turns around and says: lads she’s playing in the Aviva next week, so go easy on the tackles'”.